Not even two goals from retiring legend Arjen Robben against Sweden could save the stuttering Dutch football machine. Dutch football fans are in mourning after the once mighty Oranje failed to qualify for the 2018 World Cup, plunging the inventors of “total football” into a collective bout of soul-searching. Not even two goals from retiring legend Arjen Robben against Sweden could save the stuttering Dutch football machine, which now has the dubious distinction of failing to make it to two major football competitions in a row. After Tuesday’s match, Dutch captain and long-time workhorse Robben announced his retirement from the national team — marking the end of an era which saw him and other top Dutch players such as Wesley Sneijder, Robin van Persie and Rafael van der Vaart threaten to win the sports’ greatest prizes. Yet almost exactly two years ago to the day, Holland got their first nasty surprise when a 3-2 home defeat against a 10-man Czech Republic saw them fail to qualify for Euro 2016. Tuesday evening the “melancholy atmosphere was complete: the 2018 World Cup in Russia will be without the Netherlands, the number two in 2010 and the number three in 2014”, the authoritative daily De Volkskrant said. “I am dying of shame because of the Dutch 11,” wrote columnist Hugo Borst in the Algemeen Dagblad daily tabloid, adding the team has “lost its creativity and daring”. “No other team in the universe is playing as wide and backwards as many times as the Dutch,” he said. “Instead, the ball should be going hard, straight and forward, pure and simple. Playing wide and backwards are done by average footballers lacking self-confidence,” said Borst. Marco van der Heide, a former professional player at SC Cambuur and football commentator, agreed. “I think our biggest weakness lies at the tactical level,” he told AFP. “There are extreme differences in how we are doing things here and how it’s done outside the Netherlands,” he said. “For instance, in the Netherlands we continue to defend by covering opposing players, while most other teams including smaller countries now use the principle of zonal defending. “This means covering areas, rather than players, which makes a team less prone to leaving gaps in their defence for the opposition to exploit,” Van der Heide said. But old habits die hard, especially if you’re from the country credited for coining the term “total football”. Linked to Dutch legend Johan Cruyff, “total football” is the tactical philosophy where any outfield player can take the role of another player, thus allowing players to roam freely in different positions, so long as the overall formation is maintained. The tactic saw the Dutch reach two World Cup finals in succession in 1974 and 1978. “As Dutch supporters we have been spoilt by our achievements,” said Van der Heide. As many Dutch coaches have left to take up overseas jobs, so Dutch tactics have also become known to other countries which were paying close attention. “Meanwhile, we took too little notice about what was going on (outside the Netherlands), what works,” Van der Heide added. “Our way of playing football became too deeply rooted. 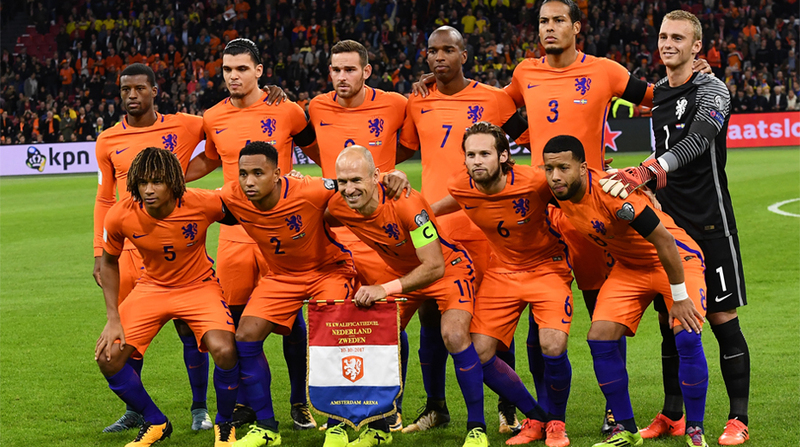 Dutch media on Wednesday called for a “clean sweep” of Dutch football, to forget about Russia and start preparing to qualify for Euro 2020. “The Oranje must start anew, but with whom? It could still take years,” the NRC daily newspaper said. Van der Heide added: “It’s clear that we don’t have quality players at the moment.